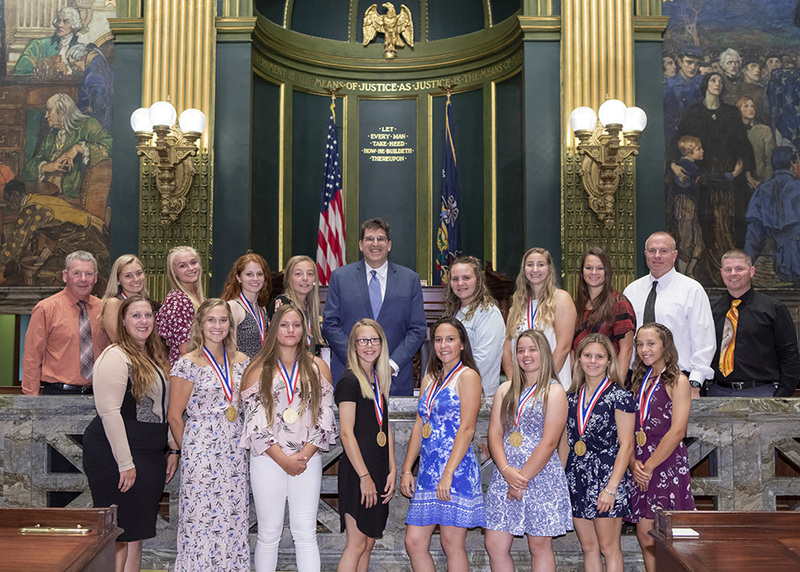 Senator DiSanto welcomes the Upper Dauphin High School Class AA State Softball Champions to the Senate. Last week, I voted for the Fiscal Year 2018-2019 state budget that holds the line on spending, increases funding for education and school safety initiatives, and includes no new taxes. While the budget spends more overall than I would prefer, it is probably the best budget that could be negotiated under this Governor, and we held firm against any tax increases. The final spending total of $32.7 billion is $560 million over the current year’s spending, about a 1.7% increase. It allocates money to the state’s Rainy Day fund for the first time in more than a decade. While the funding is critical, we are fully aware that additional money won’t solve the problem alone – we need to look at programs and resources that school districts can use to keep our kids safe. A number of measures have already been introduced, and the School Safety Task Force of which I am a member is still developing additional initiatives. We will use the summer to hold hearings, gather public feedback and work on a final product. Much of the additional spending is devoted to education. The budget increases funding for Basic Education by $100 million, Pre-K Counts and Head Start by $25 million, and Special Education by $15 million. Educational Improvement Tax Credits – which help students trapped in failing schools – will also see a $25 million increase. We certainly accomplished some good things with this year’s budget, but I fully recognize that major challenges remain in controlling overall spending through efficiency initiatives and better management, prioritizing programs based on effectiveness and outcomes, and avoiding tax increases. I know our best days can be ahead of us, fueled by strong economic growth, if only we commit to making wise financial and regulatory decisions, including ending the reliance on one-time revenues and gimmicks to create the appearance of a balanced budget. House Bill 1448 is the Education Code component. I voted against this proposal because it made hiring non-instructional third-party services more cumbersome. House Bill 1929 is the Fiscal Code component. I voted against this bill because of a newly created private dam financial assurance program that requires dam owners pay registration and annual fees. House Bill 1782 authorizes the use of alternative rate mechanisms by public utilities. I voted against this legislation because there are insufficient consumer protections to challenge alternative rate cases. House Bill 1644 establishes the Collaborative Law Act. The bill returns to the House for concurrence on Senate amendments. House Bill 1738 gives trained and certified non-municipal police officers the same jurisdictional flexibility as municipal police officers. The bill returns to the House for concurrence on Senate amendments. August 11, 2018 – Central Dauphin Class of ’78 & Friends Reunion Night at the Senators Game. Contact Jessica Moyer or Donna Demczak with questions @ 717-231-4444.